Technically I first saw Star Wars in December, shortly after it came out, but I saw it again in January and as I decided to start writing these blog entries from the beginning of 2016 these are my thoughts from my second viewing. I was obsessed with Star Wars when I was a kid. I saw the films on TV at home and was the right age when the original trilogy was re-released in the cinemas. I was also young enough to enjoy the prequel trilogy when they came out. I knew about a bunch of extended universe stuff and could reel off a load of useless trivia. Nowadays though I’m older and more critical about my films, and I recognise that even Jedi had several flaws, let alone the terrible prequels. So in my mind Star Wars is no longer this untouchable, masterpiece series, and I think that’s true for a lot of fans. People still care about Star Wars, but not as much as they once did. And that puts Disney and The Force Awakens in a great position. This film has to do two things. First, it has to show you that the new film makers understand what makes a Star Wars film and prove that they can make one. Second it has to establish some new characters who are interesting enough to carry a new trilogy of films. For my money I think it did a pretty good job. 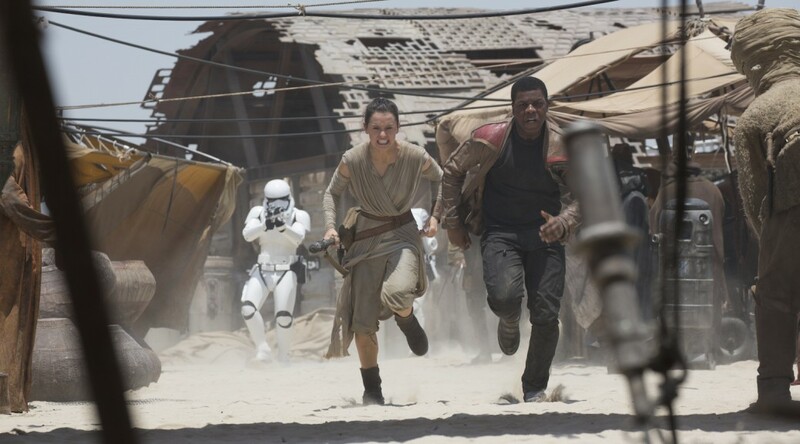 As far as making the movie a Star Wars movie goes, this film borrows a lot from the original trilogy. And I mean a lot – the nobody hero from the backwater desert planet accidentally meets a resistance hero’s lost droid who’s carrying a secret message, and consequently gets embroiled in a desperate attempt to stop a world-destroying super weapon. And that’s without the cameos from the original cast. Your mileage might vary on this – there’s so many references to the original trilogy that it could begin to feel like a retread. Personally I’m OK with it. I understand the desire to build ties with the original films, and I think there’s enough new stuff that they can get away with lifting so many elements from the past. But this only works for one film. The rest of the trilogy needs to forge its own path. Character-wise, Daisy Ridley as Rey came across as a bit wooden in the early parts of the film, mostly when she’s talking to BB-8 (which must be a difficult acting task), but once the story gets going she has some great scenes. She really won me over by the end and was probably my favourite character. I’ve heard the ‘Mary Sue’ criticism levelled at Rey – she’s great at everything she does and doesn’t seem to have any flaws – and I can see where that comes from, but it doesn’t really bother me yet. Still, I’ll be interested to see how she develops as a character. I’m also looking forward to seeing more of Finn. In a film full of references and riffs on old characters and plot lines, Finn is one of the more unique elements. Star Wars is full of heroes who bravely rise to the challenge, and it was interesting to see a protagonist who despite being brave and likeable was also terrified of the enemy, didn’t think the resistance had a chance and was just trying to run away from it all. Poe is barely in this film. He didn’t really have enough screen time to establish himself as anything more than a good pilot who makes wisecracks. I’ve seen that a million times before, so I guess I’ll wait and see how he comes across in later movies. Kylo Ren is interesting. As a character there’s a lot going on, and a lot to develop, but as an antagonist he doesn’t seem very threatening, especially by the end of the film. Without going too far into spoiler territory I’m curious how the next couple of movies will follow on from the end of this one – who and what are the protagonists going to be fighting against for the rest of the trilogy? Overall a solid crowd-pleasing sci-fi action movie that’ll probably work for fans and newcomers alike. Now for the harder task; episodes 8 and 9 have to do something new. If they just end up treading old ground and relying on nostalgia I’m going to get bored fast.